Taipei (The China Post/ANN) -The Criminal Investigation Bureau (CIB) and the Kaohsiung District Prosecutors' Office yesterday morning busted Taiwan's largest drug trafficking case in 20 years, seizing 600 bricks of heroin around NT$9 billion (US$304.7 million) at market price. The heroin discovered in a cargo aircraft at Taiwan Taoyuan International Airport. The CIB said that seven people were arrested, including the primary suspect surnamed Wong, a suspect surnamed Chu, who works at a logistics company, and a suspect surnamed Yeh, who were set to pick up the drugs at the airport. The prosecutors' office said that a drug trafficking ring led by Wong used the cover of importing Hi-Fi stereos from Vietnam to hide heroin bricks in 12 pieces of audio equipment. The CIB received a report at the end of last year claiming that Wong, who has work experience at a logistics company, allegedly conspired with an international drug ring to traffic drugs from mainland China and Vietnam to Taiwan, according to a statement by the bureau. After two years of collecting intelligence information and evidence, the CIB and prosecutors from Kaohsiung were informed on Sunday morning that the cargo would arrive that day, the CIB said. The drug-bust operation was jointly coordinated by the CIB, Kaohsiung prosecutors, the Aviation Police Office, the Customs Administration, and the two Greater Taipei police departments, which together targeted a specific aircraft and initiated their sting right after the plane touched down at the airport. A prosecutor said that the aircraft arrived at the airport around 3:20 am, and after opening the plane's cargo and sending drug-detection dogs to examine the stereo equipment, investigators discovered 600 bricks of heroin of a total weight of 229 kilogrammes stored in 12 units of stereo equipment. The prosecutor further noted that 50 bricks of heroin were found in each piece of stereo equipment, and investigators also found that Wong spread chocolate paste on each brick in an attempt to fool sniffer dogs. Operation Wiretaps 20 Lines The CIB said that a team investigating the drug ring had worked with the Taoyuan District Prosecutors' Office and legally wiretapped nearly 20 telephone lines in November. 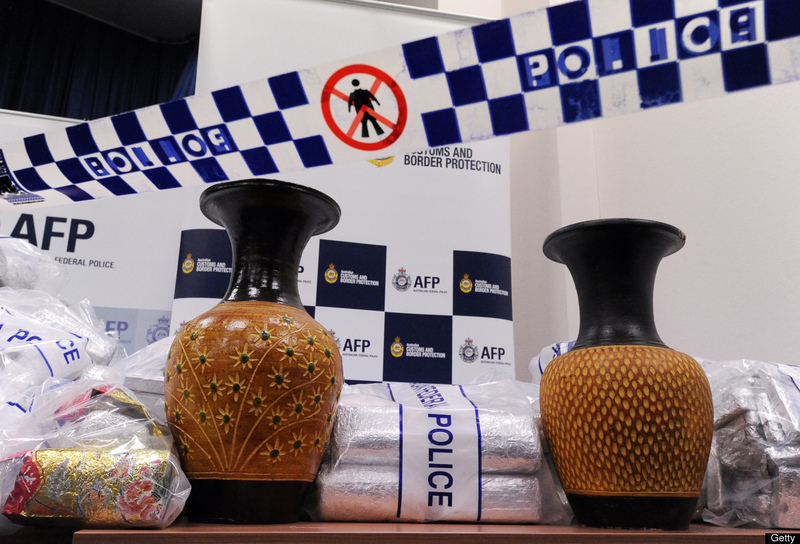 CIB Commissioner Lin Te-hua said that this case represents by far the largest drug trafficking activity in recent years, and the ring was busted because the bureau obtained valuable information through wiretapping. Lin went on to say that it is essential for investigators to legally monitor telephones so they can gather important information regarding such cases. Lin added that he hopes people can support wiretapping operations by law enforcement authorities.